You are here: Home > iOS 8 beta 3 enables Wi-Fi calling for devs, hurrah! iOS 8 beta 3 enables Wi-Fi calling for devs, hurrah! It took a while, but I’m sure it’s no less welcome as a feature. How do you enable this? I looked under “Settings” -> “Phone” and have T-Mobile, but I don’t see the option. Do you have ios 8 installed beta 3? Yes – I’m on pre-paid though. Wifi calling, in the past, has always been a feature for T-Mobile post paid customers. I haven’t heard that that’s changed. Anyone care to correct me? You’re correct. Post-paid only so a rep just told me..
Did they say whether or not it would stay that way? There are pre-paid phones with Wifi calling built in, so Wifi calling cant be a post-paid only feature. I could see it being that way during the beta period, but would expect it to be availible to prepaid at the iOS 8 release. When I had a T-Mobile phone with WiFi Calling, I used it all the time to receive calls for free and to place calls at home, where reception is weak. And i’ve always had a prepaid plan. Prepaid might have to setup their 911 address but other than that it is a TMobile branded phone feature…. Either way it doesn’t matter cause it still uses your minutes on prepaid. It’s a post paid feature only. It’s a post paid feature.. Sorry! I got it set up on mine. Plus Beta 3 is WAY smoother than Beta 2. Not a single crash yet, when before I would have had to reboot my phone at least once. Cute picture dude, but I digress. How is the call quality? And is there a way for you to confirm it’s actually a wifi call? Dumb question, but just to confirm, you’re on T-Mobile, right? Again, #nohomophobic with my picture comment. I was just giving you your proper respects. Haven’t really tried yet. Been working on the PC all day, but once I get back home I’ll try. Mine’s crashed a few times so far, but nothing reproducible. I have been beta testing since iOS 4, and I’ve got to say that iOS 8 beta 2 is by far the worst. And this is including testing on the iPhone 3G (not 3GS). Have you had WiFi calling enabled on this line for a different device in the past? I just called T-Mobile and they told me it’s something that they need to turn on in order for it to work, but since my account shows I have an iPhone their software won’t let them enable it. What is your iPhone model? It’s not working on my iPhone 5 (model A1429). Thanks. Looks like in this beta, Wi-Fi calling is limited to 5S (and possibly 5C). So far, i have yet to see a comment about it working on iPhone 5.
wifi calling is a postpaid feature. When did that happen exactly? Thanks for trying with your Google comment :). At least he didn’t say it’s says so on Wikipedia and the wiki don’t lie! LOL! Receiving calls on Wi-Fi is free even on prepaid. I don’t know since you’ll need to add Wi-Fi calling feature when you sign up for a plan? probably 2-3 years ago when there were classic and value plans. not sure though. Not seeing that option here with T-Mo Simple Choice family plan and beta 3. Maybe there’s a pending carrier update that my phone hasn’t found yet. Currently T-Mobile 16.3, anybody else? Has everyone here that sees WiFi Calling had it enabled on another device previously? Are you on wifi currently? Try restarting your phone and/or reseating your SIM. If that doesn’t work, file a Radar while you keep troubleshooting. Have you had another device with wifi calling enabled in the past? Nope. Always had an iPhone. But remember, this is a beta. Part of the purpose of it is for developers to prepare their apps, but another is to get more people using it and reporting the bugs Apple can’t find internally. It’s possible you’re seeing something that others haven’t yet and a bug report could get it in line for being fixed in the next beta. You can keep troubleshooting on your own but you should get a Radar files and let Apple help you (and you can help them). I’m guessing you’re on an iPhone 4S or 5? Wi-Fi calling seems to be limited to the 5s, based on postings at various forums. Can anyone who has used this explain how the signal display indicator looks when on a WiFi call? Currently, it keeps you connected to the cellular network (if you have service, of course). Hopefully it will allow you to turn off the cellular radio, like WP and Android devices. I think a canadian carrier confirmed iOS wifi calling support and that’s it so far. Yeah, Rogers has reported WiFi calling support in iOS8, but its a paid add-on service on their network. WTF that makes at&t and verizon look good. Yes, Canada is a perfect example of what would happen if we went to 3 national carriers. I wouldn’t start any conspiracy theories here now. AT&T don’t offer it and neither does Verizon. Could it be its a phone capability that’s available to any network operator and it’s a matter of which providers chooses to embrace it (by Apples technical methods)? Only reason Sprint hasn’t could be for technical reasons since they are all for non-standard propriety technologies. Also, amazes me how quickly we forget the iPhone was a exclusive AT&T device when it first came out, so by definition, no strange precedent has been made by Apple and it’s phones wifi capabilities. It’s not just the device. Your carrier has to support WiFi Calling AND you need a device that supports it too. For example, if you unlocked a T-Mobile wifi calling phone and used it on at&t you can NOT do WiFi Calling. I’ve long suspected the reason att/verizon have never supported WiFi Calling was because it could potentially deter some business account customers who bundle to see a need for both landline phones AND wireless phones AND home internet where if the wireless phones worked through your home internet that negates any need for landline phones. I think the reason they don’t do it is because the average customer on AT&T and Verizon probably travel more and with WIFI calling you can be in another country and call back home to your heart’s content and not be charged a dime. That’s a big chunk of money that they’d lose, plus Verizon and AT&T have the network coverage to not need WIFI calling to fill in huge gaps in the network. That’s why it’s more beneficial for small coverage carriers, like T-mobile. The ‘not need wifi calling’ argument is BS. Both at&t and Verizon have countless indoor areas where coverage is non existent. Also in times weather knocks out cell towers WiFi Calling is a good back up. 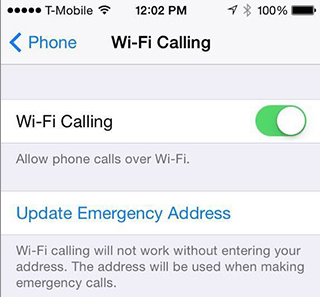 I’ve always said, when WiFi Calling hits iOS it’ll finally get the attention it deserves. At the very least people on at&t/verizon will be asking why they DON’T have this feature. If you lived in the mid-west then you wouldn’t think that argument is BS. I live in Minnesota and agree with his statement, all carriers should have this feature regardless of if they need it or not. ATT/Verizon don’t have WiFi calling service. I do think TMO is forging a partnership here and wouldn’t be surprised if the results of the 7-day test drive don’t surmount to some kind of special deal this fall. Tim Cook’s Apple isn’t playing the games that Steve Job’s Apple did. Because in your reality T-Mobile the smallest national carrier is somehow more important to Apple than Verizon, AT&T or Sprint? Seriously? I think you’re reading way too much into it. You yourself said Rogers is offering that functionality as an Add on service in Canada, so your true thoughts are betraying your emotions… Just saying. I mean it can’t be tailor made and exclusive if Rogers can provide that feature. Sure it can, the US market isn’t Canada. You said it yourself, AT&T once had the iPhone exclusivity in the U.S, despite it being available on multiple carriers overseas. The iPhone has reached saturation point on Sprint/VZW/ATT, they aren’t moving any more devices (in fact they are losing to Android OEMs). Right now TMO is the most important carrier and 1/3 of its sales are iPhones. TMO is growing faster than the others and most of their customers are still unaware that they sell the iPhone. I fully expect a special iPhone plan this fall. Its just common sense. They did something similar with AT&T and their microcell. Google “AT&T microcell iPhone” and view the images. All of that is included in the OS. Its a bit different. M-Cells act like regular towers (miniaturized versions) broadcasting on 850 or 1900 (using your ISP as its backbone). There isn’t any special code modification except to display M-Cell connectivity. WiFi calling (UMA) does require the inclusion of code to authenticate on each specific network since each carrier had a different implementation. Well no, it’s not the same thing at all. But it was something custom implemented for AT&T. Wi-Fi Calling is OS-wide in iOS. There’s no favoritism. It’s not up to the carriers to jump on board. Granted, I doubt Wi-Fi Calling would have been implemented if T-Mobile wasn’t an official carrier. T-Mobile happens to be the only US carrier to currently support Wi-Fi calling. There are other carriers around the world that support it as well. I was always under the impression that “Unlimited Wi-FI Calling” was a post paid feature, while the ability to make calls over wi-fi was dependent on the phone. You just need a T-Mobile sim card and compatible phone. That’s it! You can use WiFi Calling. All it is is cell reception via WiFi instead of a cellular tower. It’s crazy people find things to get so confused about over this. T-Mobile offered a free feature for post paid accounts long ago where WiFi Calling didn’t use plan minutes but it’s pointless now. The primary benefit of WiFi calling is reception. The second benefit is free calls back to the US when overseas. UMA (Unlicensed Mobile Access) > Wi-Fi Calling as it allows handoff between cellular and Wi-Fi and vice-versa while in the call. He’s thinking of Uma Thurman. The actress. Yeah that’s why I was asking if he was being sarcastic. WIFI calling works with a prepaid account. Minutes are charged however. Wifi calling sounds interesting. I can barely get any tmo signal at my workplace (UCSF). This will make my phone functional again at work. How about txt mgs? Will wifi get those through too? moron, same principle as wifi calling. Wrong.. iMessage is the system that decides if it send it via Apple’s iMessage system or falls back to sending SMS TXT message. When you open any texts on an iPhone, it’s in iMessage Application.. EVEN SMS messages.. always. I can’t confirm on an iphone as the only one on my plan that uses one is not a beta tester, but I can confirm on android I can send standard text messages when Wi-Fi calling is enabled and I have no cell network signal. TXT’ing is buggy right now. Can seem to receive SMS TXT’s.. but it fails to send them.. I have iOS 8 Beta 3 and it seems to not work for me. Thanks, it seams to work now. Does it only work for Iphone 5? I have the iPhone 5S, So I wouldn’t be able to tell you, but I don’t see why it won’t. I downloaded ios 8 beta have a t-mobile account. Have updated my 911 address. Wifi calling says that I have to call customer service. This is Apple’s way. The “it just works” mantra is incredibly frustrating for those of us who like to see what’s going on. Where is the GPE love? I’d love to ditch Sense on my M8 but if I move to GPE I lose T-Mobile Wifi calling. Ask Google to implement it on the AOSP level, otherwise never. Call quality is the same as WiFi Calling on other handsets, but I haven’t called another T-M HD supported handset over wifi to know if those calls are HD. This is a beta so lets hope that the next release includes some sort of indicator. Your post confuses me. iMessage has always worked using data even before WiFi calling existed. Unless of course you are sending a “text” message with iMessage rather than an actual iMessage. It looks like this is only working on iPhone 5s at this point. Could not get it to show up on my iPhone 5. Something that windows phone has been able to do for the past 2 years already. says who? You? Lol what a clueless dumbass. No one buys Windows Phones. yeah, no, he’s kinda right. Just traded in my Lumia 1520 for a Nexus 5, I figured I’d keep my crappy apps (Android) and crappy locked down ecosystem (iPhone) on two separate lines. Does not work ! I get an error message saying… “Enable Wi-Fi calling on this account contact your carrier.” So I contacted T-Mobile and they told me that the Wi-Fi calling would be activated in two hours. I am using an iPhone 5s anybody else having issues like this? You have to have the Wi-Fi Calling feature added on your account, also your E911 Address has to be up to date and correct. wilfredo is your iphone cdma phone? Yes, it is the Verizon iPhone 5S, however I inserted a postpaid T-Mobile SIM Card and the Wi-Fi calling seemed to work. Only incoming texts worked and incoming calls. On the prepaid $30 T-Mobile plan I continue to get that error that I mentioned earlier. Must be a problem with T-Mobile’s prepaid services, or random because other people on T-Mobile’s prepaid services say that it worked for them. I have verizon Iphone 5s and prepaid T-mobile simcard. I have the same error when try to use wifi calling. could be t-mobile prepaid problem. Hopefully they start fixing these problems in the next betas. Because even the iPhone 5 doesn’t get the option of Wi-Fi calling it is limited to the iPhone 5S at the moment! T-Mobile BETTER support Wi-Fi calling on their prepaid lines or else! They cannot just only support postpaid customers that would be VERY anti-consumer of them! are you sure about that? then why is it available on verizon ipone? Has anyone actually gotten Wi-Fi calling to work on their iPhone with a prepaid T-Mobile account? Also there’s no indication that the phone is even on Wi-Fi calling at all. The status says “No Service” I fortunately texted myself and I was able to receive the text messages but unable to send any texts because they would fail. So, would this hypothetically work on an airplane that has been wifi equipped? Probably not. Inflight calling is banned for good reason on most airlines – which means wifi calling is likely blocked. If the firewall allows it. Most airline net block this to keep passengers from wanting to punch out a chatterbox. I have an iPhone 5S from T-Mobile. It is currently running iOS 8 Beta 3. I can make and receive a wifi call, but I cannot send a SMS Text Message. Although I do receive SMS Text Messages. Is there a carrier update I am missing? or is this a iOS 8 beta 3 problem? Also I find it intreasting I have had iOS 8 Beta 3 for a few days now, but I have just started receiving SMS Text Messages this morning, in the past I’ve always had to go find reception. It’s just amazing that Apple made this decision to support a consumer friendly feature on the smallest national carrier – love it. I don’t think this will end up being something your carrier has to approve. Apple will probably make it totally separate… Which would make it so you can make phone calls on your ipod as well, just assign you a random number which has no carrier connection. Yes it will. A SMS is sent through Verizon, AT&T, or Sprint’s server before relayed back to the phone. Without a carriers support it is impossible. Also that will never happen on the iPod, Apple will do nothing to lessen the use of an iPhone or even come closer to being one. They want people to switch to an iPhone from an iPod in hopes to gain market share. That’s all this battle is over! Will this Wifi work with a unlocked ATT iphone and my tmobile sim?